At a governing Fidesz-KDNP party congress on Tuesdsay, Fidesz chairman and Prime Minister Viktor Orbán announced government plans to do away entirely with unemployment assistance and, in its place, induct the unemployed into public work programs. Whereas most of Europe has reacted to growing unemployment by increasing social spending, Hungary plans to expand its public work program and eliminate unemployment assistance altogether. This could be suicidal in the long run, especially as public work is not a gateway to proper work, regardless of what the government says. At a recent ribbon-cutting ceremony Orbán announced government plans to eliminate unemployment assistance altogether by 2018 and to reach a point where “everybody has a job from which it is not only possible to live, but prosper”. Orbán believes the government should support work and not unemployment. Viktor Orbán has long maintained that social welfare societies have failed, claiming “welfare is not the basis for anything except its consequences”. He thinks this is why it is necessary to create a state based on work, in which the citizens do not live off of public assistance but earn money through work. Between 2009 and 2012 unemployment assistance was cut by one-third to HUF 28,800 (USD 120) a month. The proposed national budget for 2015 expands public work to its highest level to date while continuing to decrease unemployment assistance. HUF 270 billion (USD 1.1 billion) has been budgeted for public works in 2015, HUF 40 billion (USD 163 million) more than in 2013. 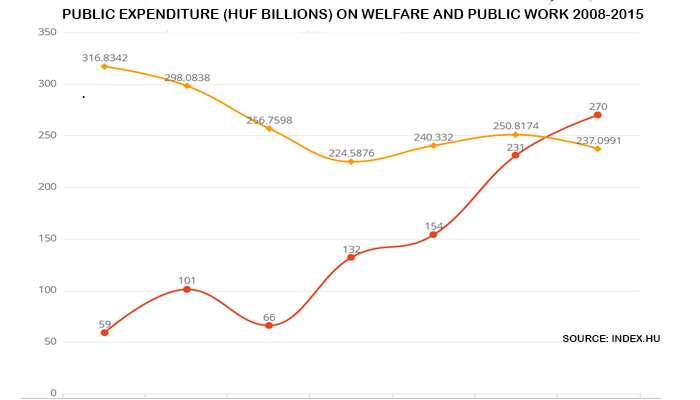 By contrast, only HUF 237 billion (USD 967 million) has been budgeted for unemployment assistance, making 2015 the first year the government will spend more on public work than on unemployment assistance. 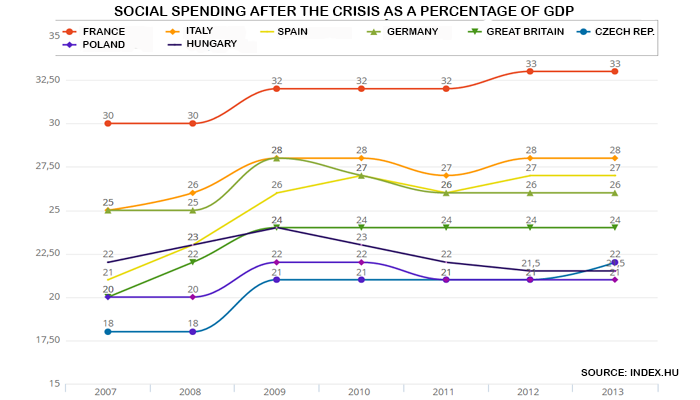 Social spending in Hungary has decreased at a time when most European countries have reacted to the economic crisis by increasing social spending. The number of Hungarians threatened with poverty and social exclusion, that is earning less than 60 percent of median income, has increased 7 percent since 2009. Since 2008 the percentage of Hungarians suffering serious material deprivation has risen from 18 percent to 26.8 percent. The number of poor has increased from 2.92 million in 2007 to 3.3 million in 2014, public work notwithstanding. Record numbers of Hungarians employed in public work (as well as working abroad) help explain how official unemployment numbers for June through August fell to their lowest level in years. 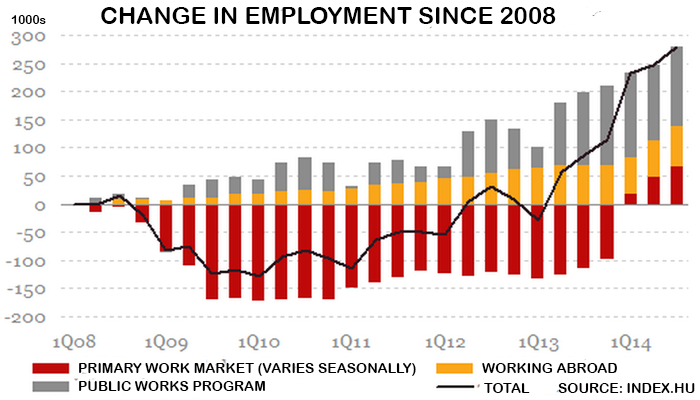 Index calculates that without public work, unemployment would exceed 11 percent. However, the numbers do not support Orbán’s claim that public work returns the long-term unemployed to the “world of work”. According to an MTA economic study between 2011 and 2012 18% of those engaged in public work schemes went on to find jobs in the work market. In 2012-2013 this number decreased to 13%. Minister of Interior Sándor Pintér stated recently that of the 99,571 who participated in the 2013-2014 winter public work problem, 14,965 or 16.11 percent found a job afterwards. That is a relatively low rate of success for a program the government claims will lead hundreds of thousands of long-term unemployed back to work. A separate study prepared by the Network Against Poverty concludes that public work, in fact, does not lead back to the work market, and that for this reason it is not an effective antidote for employment. MTA believes public work can be outright dangerous because the more time someone spends engaged in it, the more difficult it is for him or her to cross over to the work market. Researchers think the reason for this is that if public work is readily available, then the unemployed will have less incentive to find real jobs, which requires significantly more effort than simply walking into the local government office and asking for a job. People get stuck in public work because they do not develop useful skills necessary to find a real job. Public workers often don’t have energy to look for a job while engaged in public work. Furthermore, according to the Network Against Poverty, local governments often obstruct public workers from looking for jobs because they appreciate the cheap labor. Orbán has claimed on numerous occasions that public work is necessary to lead the long-term unemployed back to the work market. He points out that for many public workers, including some 57,000 Gypsies, this is the first time they have held a job. Such statements promulgate stereotypes about public work that are both inaccurate and misleading. According to the Network Against Poverty study, it was not for laziness that many public workers never held a job before. Poor people have to eat and provide for their families, too, and work very hard to earn what little money they can. Often they can only get seasonal or occasional work for lack of training or education. More often than not, such work is “cash in hand” and not reported. According to the Network study, many public workers have unofficial evening jobs and even work at the weekend, sometimes for 12-14 hours at a stretch. Another group of public workers are those who lost their jobs after the crisis and have not been able to find one since due to inadequate schooling or lack of workplaces where they live. 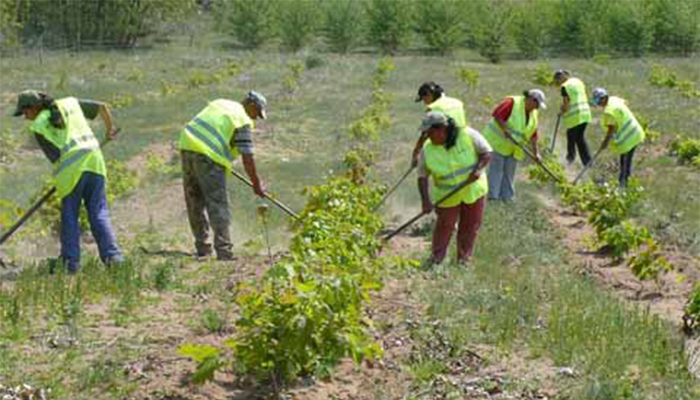 The MTA study confirms that public work is not only characteristic of remote villages. The program covers the entire country and many are engaged in public work in the cities, including a number of people with university degrees. Underlying the government’s actions is the assumption that the unemployed are lazy and must be forced to work. MTA researchers believe that it is not a question of willingness to work, but whether they can afford to purchase the bus ticket to go to a job interview or whether a bus arrives in time to the place where they could work. It also depends on the individual’s ability to support himself while looking for a job. At today’s prices unemployment assistance of HUF 28,800 a month does not go very far and only lasts for three months. According to MTA this is hardly enough time to find a job. Experts question the wisdom of expanding the public work program at a time when the Hungarian economy is starting to grow and companies are starting to hire again for the first time in many years. They are worried that the expansion of public work will lock hundreds of thousands of unskilled and underskilled workers out of the work market while forcing hundreds of thousands to go without public assistance altogether. They fear that the government is sowing the seeds of social conflict in the years to come. What the index article does not mention is that a number of public sector employees have been replaced with public workers costing half as much.